Back in 2011, when we first started recording The Cloudcast, we thought it might be funny to pretend to have sponsors so that people might think the show was legitimate. Keep in mind, our pitch to guests was, "We're two nobodies that don't live in Silicon Valley, and our show has no audience, but we think you're really smart and we'd like to record the discussion and put it on the Internet. So do you want to be a podcast guest?" For the kids out there, this was way before Blue Apron and Stamps.com and Tommy John Underwear were a part of your daily podcasting experience. 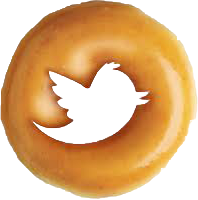 If you go all the way back to Episode #2, we joked that Krispy Kreme should be our first sponsor, because we had been running in the Krispy Kreme Challenge for the last couple years. Since then, it's not unusual for us to meet people in person and they know us more for "the donut race" than anything on the podcast. And to be quite honest, that's OK with us. Before we talk about why we fundraise, it might be useful to explain "the donut run" to anyone that's new to the podcast. Here's the TL;DR version. 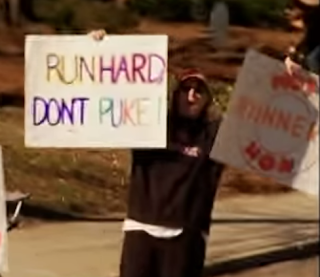 Many years ago, a bunch of (probably drunk) fraternity dudes at NC State University (in Raleigh, NC) had a crazy idea - run 2 miles from campus to the local Krispy Kreme store, eat 12 donuts, and run 2 miles back in under an hour. Simple southern comfort food, meets the joys of the outdoors, meets the stupidity of exercise. And then throw in the costumes of Mardi Gras, and the uncertainty of the weather in the South in early February. Even ESPN has recognized it as feat of human achievement on par with the Olympics or Tour de France. NOTE: When the race started, it was only 4 miles. Now that there are nearly 10,000 people running, they had to expand it to 5 miles to better manage the crowds. Our stomachs did not get a vote in this change. The race has always had a charity element, with the proceeds of the entry-fees going to the NC Children's Hospital. But in 2013, they decided to allow "team donations" as a way to expand their reach. NC Children's hospital isn't a regular hospital, it's focused on the families of children with extreme situations. Their level of care for both the children and families is world class. So in 2013, we decided to ask our community if they'd help us raise money. What happened next was beyond our wildest expectations. Donations came in from people that we had never met, from around the world, for amounts that were well beyond "nice". And the donations have kept coming in, year after year after year. 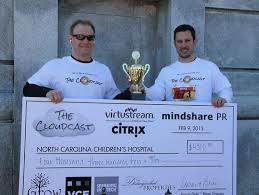 In the 5 years of fundraising, The Cloudcast community has raised nearly $23,000 for those children and their families. Medical care is extremely expensive, and those donations are making a difference. It's something that everyone that has opened their wallet should be very proud of. One of the coolest perks of the generosity of our community is that Team Cloudcast has won the "most donated" award for the last 5 years. This means that we get to stand with the organizers and present them a (literally) big check each year with all the donor's names and logos. 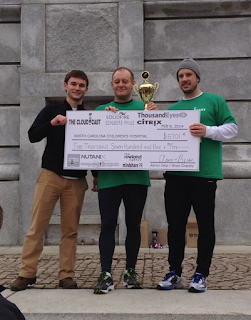 As we get older and our brain (and knees) tell us not to run in the cold and eat all those donuts, the thought of being able to present that check each year has become the motivation for us to train prior to the race. In many technical communities, there's a saying: "We like the big ideas, but we really need people that are willing to chop wood and carry water." That's kind of how we think about this race, in the context of its impact to the charity. Aaron and Brian are more than happy to be the ones that chop wood and carry water - or in this case - run miles and eat donuts. What we need are the people with a big idea - the idea that today you're going to make a donation (of any size) to help make things a little better for a sick kid or their family. Even if it's only $10, it's the big-ness of saying that someone else's health is more important today than your coffee or your Uber ride or your craft beer. Thanks to everybody that has generously given in the past, and to anyone that is considering giving against this year. We love representing the best community in technology, and the kids and families at NC Children's Hospital appreciate your caring spirit. 100% of all donations go to the NC Children's Hospital and are tax deductible (at least in the US). Want to run with us? You can register here. Can't make it to Raleigh in February? Sign up to do a virtual event with your friends. 12 donuts is 2400 calories. A couple hours after the race, you will experience a sugar crash like you won't believe, and you'll nap on the couch throughout the afternoon. For some reason, Aaron always goes to get a milkshake after the race. Except for years when someone is sick, we've always eaten all 12 donuts. Neither of us has ever puked, but there's always a first time for everything. We've never worn costumes, but we're always open to good costume ideas. One year, Brian sprained his ankle about two weeks before the race and had to keep the ankle in a bucket of ice water for 30-60mins a day to get the swelling down enough to get shoe on. One year, a crew of students from Duke University interviewed us and followed us around as the subjects of a project they needed to graduate. We're not sure if they ever graduated. The weather during the race is usually in the 40s, but at least 1 or 2 times it's been freezing rain or snow. Not fun!